One of my regular anglers from out in Idaho is both a great fly tyer and an avid hunter. This means he has access to natural materials that we don't usually find here in our coastal fly shops, like antelope pelts. On his trip to Pine Island last month he brought several great looking slider patterns tied with pronghorn antelope hair. This is some of the most boyant natural material I've ever seen. It's also a lot easier to spin than the more commonly available deer hair used in most commercial slider patterns. I used one of these flies to land this nice red on a very low tide just a few days ago. 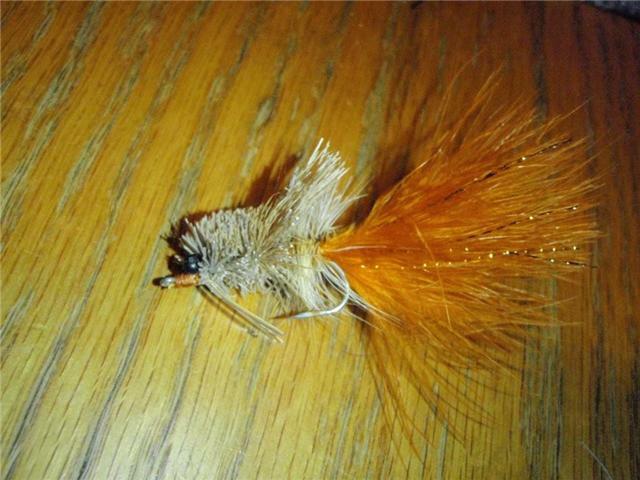 Antelope hair is available from several different online fly shops for around $6 per package. This is enough for dozens of sliders or other saltwater sized flies. I've never tried this hair before but now it's all I'll use for my topwater flies. Give this stuff a try and you'll be sold on it, too. Running out in bank of solid fog is a little bizarre for me. It felt like we were in the opening scene of "King Kong" and were pushing through heavy mist to get to Skull Island. In the past fifteen years of fishing Puerto Rico and the Keys I've seen fog about four times. We were in my buddy Capt. Joe Harley's boat this morning and fortunately his brain has a built in GPS for this area. He got us to a great flat without plowing into anything solid. The fog started lifting at about 10 AM. We had mullet everywhere and that means redfish too at this time of year. We didn't have many tailing fish but Joe spotted one feeding just a few yards from the bow. I dropped an Olive Schminnow on its tail but the red still came charging after it. This one had some bonefish genetics in it since it tore off at Warp Speed and got me well into my 9 weight's backing. I haven't had a redfish do that in a long time. He was a solid 24 inches and was fooled by an olive Crystal Schminnow fly pattern. Pine Island is tailing redfish heaven right now. We had more great shots at these fish this morning than any other day this fall. My anglers were Ron Smith and Jim Chell of Melbourne, FL. The guys made the trek across the State to check out the area for the day and saw the best that Pine Island had to offer. We hit Smokehouse Bay at first light, one of my favorite places in Matlacha Pass. With a new moon and a strong -1.3 falling tide, the water was rushing out of the bay and interesting things were happening all over the place. Ron was the first to hook up with a nice but barely slot sized redfish on a Sebile topwater lure. Topwaters have been really effective lately but you can't use them on just any tide. Falling water is the best since it flushes out the surface grass that fouls them so quickly. Jim also hooked a solid red on a Sebile but it came unbuttoned at boatside. Not a problem since we were releasing all of these fish anyway. When the tide had bottomed out the guys switched to weedless Gulps and the first fish was short snook that was busting bait in a small pothole. Although this fish was well under the slot we flushed dozens of snook out from the mangroves that well over the 28 inch limit. Other than the one Jim landed, the rest of the snook had a case of lockjaw this morning but some live bait would have easily cured that. After nearly getting stuck in the rapidly draining bay, we decided to head to the other side of Pine Island and try the waters around Useppa and Cabbage Key. Fishing the big grass flats around these islands reminds me of the Keys or Puerto Rico. It's as clear as any bonefish flat and sightcasting to the reds there is just as challenging. With several oyster bars still exposed the reds were tailing everywhere. One of the first fish we poled up to had its head so far in the grass that it never saw the first half dozen casts Ron threw at it. After finally laying a Gulp right on its head the red hit and ran off like a mole burrowing through the grass. This is why using braided line in this area is a necessity. Mono, while less expensive, would have never held up to this. An hour later the fish had stopped tailing so we ran back to Smokehouse Bay to catch the middle of the flood tide. We pushed through the bay where it was still shallow and were quickly after another school of tailers. Jim dropped a weedless Gulp right into them and got an instant eat. This was the fish we were looking for, big enough to spin the bow of my Beavertail skiff on its own. After several big runs we got it boatside for a few photos and a quick measurement: 26 1/2 inches. We tried to land a quick trout to complete the Slam for Jim but of course the easiest species of the three didn't cooperate, even though we saw dozens of huge ones darting out of the sand holes. Despite missing the Slam this was one of the best days I've had this season. We hooked six reds, boated four,and cast to nearly a hundred more. Throw in the perfect blue skies and temps in the upper 70's and Pine Island is the perfect place for shallow water anglers right now. These reds were caught in the south part of Matlacha Pass on a white Zara Spook topwater plug. This is the best all-around lures for this area during the fall. The big redfish love it and so do the snook. It's also one of the easiest artificials to use in both fresh and saltwater. A few quick twitches and any predator will slam it, no problem.